Our current economic system is focussed on constant economic growth. Both individually and as a community, organisation or nation, we need to be consuming more ‘stuff’ this year than last. That is how we define ‘progress’, ‘development’ and ‘success’. Increasingly, economists, politicians, academics and environmentalists are recognising that we need to value more than just money and that we must rethink how we measure and define progress. Wellbeing is emerging as a key factor in what development really means as it affects vital elements of our lives – including health, education, economy, environment and justice. Whilst a greater political focus on wellbeing is emerging at national and international level, there is still a significant gap when it comes to local governance, despite the increasing pressures of urbanisation world wide. Happy City was set up to help make this shift to wellbeing as a crucial factor in governance at local level. Our aim is to support individuals, communities and decision makers put the happiness of people, place and the planet at the heart of how we make decisions. Happy City has developed a range of measurement tools that provide innovative yet practical answers to many of the difficult questions regarding data and outcome that change-makers face when delivering real wellbeing improvement at a local-scale. There is already international interest from as far afield as Australia, USA, Canada, South Korea, UAE and across Europe. Make the invisible visible: Our current means of measuring and understanding what makes cities thrive are largely based on very simplistic economic outcomes which miss many vital elements of personal, environmental and social capital. 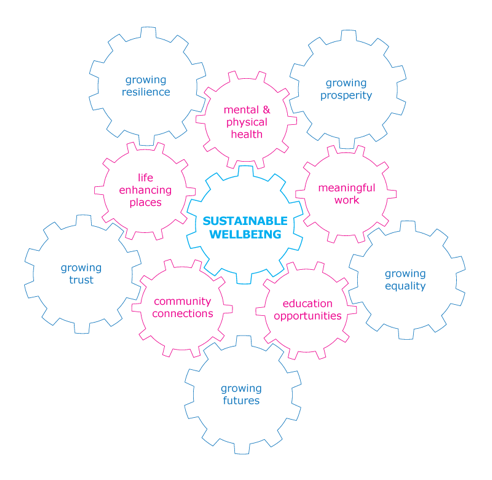 Measures of wellbeing take these seemingly intangible factors into account and provide a much more complete picture of the determinants and drivers of sustainable prosperity. Provide multiple benefits: Research shows that improvements in wellbeing support long-term improvements in many policy areas including health, productivity, security, social behaviours and education (the list is growing), demonstrating that wellbeing policy, investment and action are not a luxury, but a necessity. Create a common currency. Due to the impact that wellbeing has on so many policy areas, wellbeing data can be used to value the effectiveness of policies and interventions across policy silos.